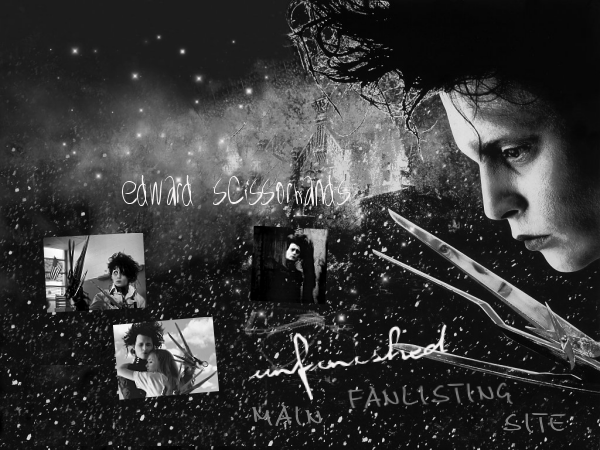 Welcome to Unfinished, the fanlisting for the adorable & film title character of Tim Burton's masterpiece Edward Scissorhands! I absolutely love Edward to pieces, and am thrilled to own this fanlisting. A fanlisting is a list of fans from around the world stating that they are a fan of a particular subject. In this case, that subject is the character Edward Scissorhands, so if you are a fan like I am, join up! I'm not affiliated with Johnny Depp, Tim Burton or Edward Scissorhands in any way, nor can I get in contact with anyone who is. I am just a fan showing my appreciation.